On September 3rd I departed Boston for London, England to study at Saint Mary’s University for four months. I was excited, extremely nervous, and really did not know what to expect. Before even arriving in England, I thought that this semester was going to be all about traveling and visiting new countries. I did not plan on getting super involved at the school, and only really talked to the other Americans that I was with for the first couple of weeks. I had the expectation that the UK students would do their own thing and I would do mine; which was take classes during the week, and travel on the weekends. But after Freshers Week (or orientation week) my semester plan completely changed. I decided to throw caution to the wind and really push myself out of my comfort zone. I joined the dance team, made some friends in my residence hall, and went to all the events held by the student union to really immerse myself into the culture of the university. This turned out to be the best part of my experience abroad. I have visited lots of new and exciting places on the weekends, but I have also made some amazing friends that live here in England. It is so fun to chat with them about the differences between the United States and the UK. I have learned so much about their history and culture, and even picked up some slang words that they use (instead of “how are you?” they would say “you alright?”, an umbrella is a “brolly”, rain boots are “wellies”, etc.) I have also been able to go back to their hometowns with a few of them on some weekends as well, and get the true English experience. My friend Clara took me back to her home in Oxford last week, and gave me a tour of Oxford University and showed me around Blenheim Palace where she works over the summer. The weekend before that, I went to Windsor with my friend Emily to tour Windsor Castle and have a traditional Sunday roast at a pub. Looking back on this semester, being involved at Saint Mary’s and making friends with people that I would not have necessarily ever crossed paths with has been the greatest blessing. London is also the most amazing city to study in! There is so much to do and see, especially around Christmas time. 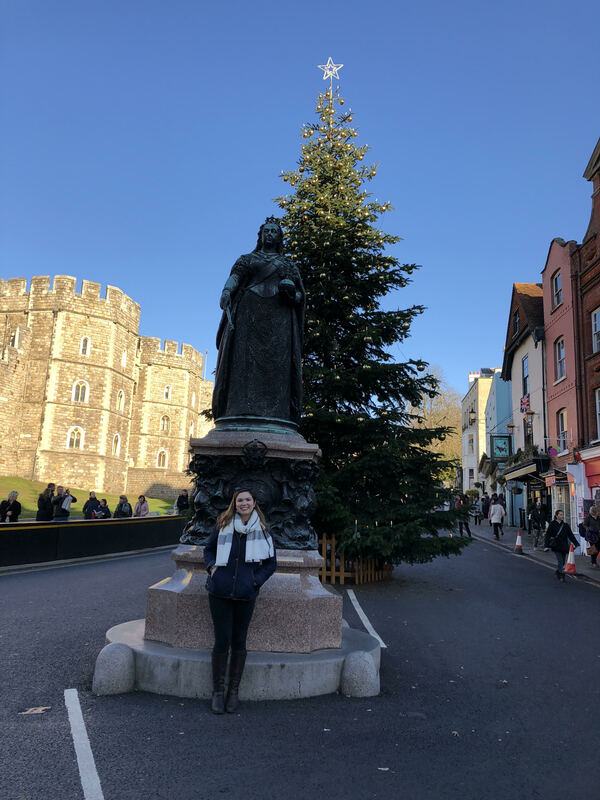 From the Christmas tree lighting in Covent Garden, to seeing brilliant musicals in the West End, and watching the changing of the guard at Buckingham Palace-the adventures are never ending. I will be really sad to leave this beautiful country in a few weeks, but I am so grateful and lucky to have been able to study in such a welcoming place with great people that have felt like family. My new English friends are even planning to visit me in Boston next summer! Thanks to Catholic University for this amazing opportunity, and to Saint Mary’s for being my home away from home.